When a salvage crew is tipped off to the location of a large ship in international waters, they can’t pass up the opportunity to claim it. But the ship isn’t as dead as they originally thought – or as dead as they will be, if it gets its way. I’ve always had a bit of a soft spot for Ghost Ship. Oh, sure, it’s horribly corny, particularly in some of the more “emotional” scenes (by which I mean ‘scenes that were clearly meant to be emotionally charged, but were mostly just a showcase of slightly over the top acting – particularly from Desmond Harrington, who was exceptionally bad’). And, in part because of this, but also because it never quite builds up enough gravitas to be taken seriously, it doesn’t really do ‘horror’ very well. Despite these issues, Ghost Ship manages to be entertaining enough for me to look past the corniness for a few reasons. Firstly, the pacing is handled in a way that means, despite there being several scenes of characters sitting around having Serious Conversations for relatively lengthy periods of time, there’s enough action/paranormal activity/etc. mixed in among these scenes to keep things interesting. Secondly, the set design is great – and it’s used to the fullest extent. There’s always something to keep the eye interested. And, lastly – but probably most importantly, for me anyway – its opening scene, and the scene showing what unfolded on the ship after this, are fantastic. 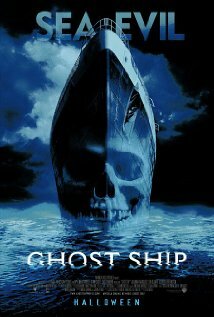 They’re creative not only in what happens, but also in the way that they’re filmed, edited and scored, which all combine to mean that over a decade later I still think that Ghost Ship has one of the best opening scenes in a horror movie. I don’t know if it’ll ever get old for me; and on that basis alone I can see myself continuing to dust this movie off at least a couple of times every year. Nice review, I have a soft spot for this one as well. I’m glad I’m not the only one, haha. I think it just plays into that mix of camp and horror that I love so much, thanks to being brought up on 80’s horror. Have you done a post on “Thirteen Ghosts” ? That’s one horror movie I think a lot of people forget for some reason, when actually it was pretty good like this one. Not yet, but it is one I’ve put on my ‘to do’ list. Funnily enough it was watching this movie that made me think of it, too! The Writer's Multiverse A hub of creativity, critiquing, opinionating and storytelling.